The asthenosphere is a part of the upper mantle just below the lithosphere that is involved in plate tectonic movement and isostatic adjustments. The lithosphere-asthenosphere boundary is conventionally taken at the 1300 °C isotherm, above which the mantle behaves in a rigid fashion and below which it behaves in a ductile fashion. Seismic waves pass relatively slowly through the asthenosphere compared to the overlying lithospheric mantle, thus it has been called the low-velocity zone (LVZ), although the two are not exactly the same. This decreasing in seismic waves velocity from lithosphere to asthenosphere could be caused by the presence of a very small percentage of melt in the asthenosphere. The lower boundary of the LVZ lies at a depth of 180–220 km, whereas the base of the asthenosphere lies at a depth of about 700 km. This was the observation that originally alerted seismologists to its presence and gave some information about its physical properties, as the speed of seismic waves decreases with decreasing rigidity. In the old oceanic mantle the transition from the lithosphere to the asthenosphere, the lithosphere-asthenosphere boundary (LAB) is shallow (about 60 km in some regions) with a sharp and large velocity drop (5���10%). At the mid-ocean ridges the LAB rises to within a few kilometers of the ocean floor. 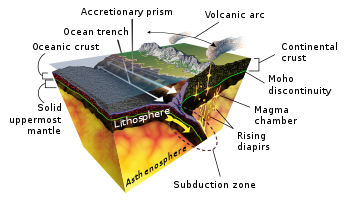 The upper part of the asthenosphere is believed to be the zone upon which the great rigid and brittle lithospheric plates of the Earth's crust move about. Due to the temperature and pressure conditions in the asthenosphere, rock becomes ductile, moving at rates of deformation measured in cm/yr over lineal distances eventually measuring thousands of kilometers. In this way, it flows like a convection current, radiating heat outward from the Earth's interior. Above the asthenosphere, at the same rate of deformation, rock behaves elastically and, being brittle, can break, causing faults. The rigid lithosphere is thought to "float" or move about on the slowly flowing asthenosphere, allowing the movement of tectonic plates. Although its presence was suspected as early as 1926, the worldwide occurrence of the asthenosphere was confirmed by analyses of seismic waves from the 9.5 Mw Great Chilean earthquake of May 22, 1960. ^ Barrel, J. (1914). "The strength of the crust, Part VI. Relations of isostatic movements to a sphere of weakness – the asthenosphere". The Journal of Geology. 22 (7): 655–683. Bibcode:1914JG.....22..655B. doi:10.1086/622181. JSTOR 30060774. ^ Harsh Gupta (29 June 2011). Encyclopedia of Solid Earth Geophysics. Springer Science & Business Media. pp. 1062–. ISBN 978-90-481-8701-0. ^ Lev Eppelbaum; Izzy Kutasov; Arkady Pilchin (29 April 2014). Applied Geothermics.Lev Eppelbaum; Izzy Kutasov; Arkady Pilchin (29 April 2014). Applied Geothermics. Springer Science & Business. pp. 318–. ISBN 978-3-642-34023-9.Springer Science & Business. pp. 318–. ISBN 978-3-642-34023-9. ^ Hofmann, A.W. (1997). "Mantle geochemistry: the message from oceanic volcanism". Nature. 385 (6613): 219–228. Bibcode:1997Natur.385..219H. doi:10.1038/385219a0. ^ Self, Steve; Rampino, Mike (2012). "The Crust and Lithosphere". Geological Society of London. Retrieved 27 January 2013. ^ Forsyth, Donald W. (1975). "The early structural evolution and anisotropy of the oceanic upper mantle". Geophysical Journal International. 43 (1): 103–162. Bibcode:1975GeoJ...43..103F. doi:10.1111/j.1365-246X.1975.tb00630.x. Retrieved January 24, 2016. ^ Philip Kearey (17 July 2009). The Encyclopedia of the Solid Earth Sciences. John Wiley & Sons. pp. 36–. ISBN 978-1-4443-1388-8. ^ Lev Eppelbaum; Izzy Kutasov; Arkady Pilchin (29 April 2014). Applied Geothermics. Springer Science & Business. pp. 318–. ISBN 978-3-642-34023-9. ^ Condie, Kent C. (1997). Plate tectonics and crustal evolution. Butterworth-Heinemann. p. 123. ISBN 978-0-7506-3386-4. Retrieved 21 May 2010. ^ Kearey, Philip; Vine, Frederick J. (1996). Global Tectonics (2 ed.). Wiley-Blackwell. pp. 41–42. ISBN 978-0-86542-924-6. Retrieved 21 May 2010. ^ Rychert, Catherine A.; Shearer, Peter M. (2011). "Imaging the lithosphere-asthenosphere boundary beneath the Pacific using SS waveform modeling". Journal of Geophysical Research: Solid Earth. 116 (B7): B07307. Bibcode:2011JGRB..116.7307R. doi:10.1029/2010JB008070. ^ Mark Hendrix; Graham R. Thompson (24 January 2014). EARTH2. Cengage Learning. pp. 493–. ISBN 978-1-305-43687-9. ^ Tom S. Garrison; Robert Ellis (5 December 2016). Essentials of Oceanography. Cengage Learning. pp. 19–. ISBN 978-1-337-51538-2. Turcotte, Donald L.; Schubert, Gerald (2002). Geodynamics (2nd ed.). Cambridge University Press. ISBN 978-0-521-66624-4. Retrieved 24 January 2016. McBride, Neil; Gilmour, Iain (2004). An Introduction to the Solar System. Cambridge University Press. ISBN 978-0-521-54620-1. Retrieved 24 January 2016.